You may have visited the BJ’s Bingo Reading, Birmingham or Leigh land-based casinos or across the globe and loved it, but they’re a fairly new addition to the online community. Their target audience is predominantly female so this is rather a girly haven for bingo aficionados, although there’s fun for everyone at this site. If you’re paying attention to the right promotion (of which there are many), you can overload on BJ’s Bingo free spins and play slots to your hearts content. The current welcome offer to spin the mega reel is on another level, with a whole host of bonus prizes and the exciting added mystery of seeing which one you’ll score. 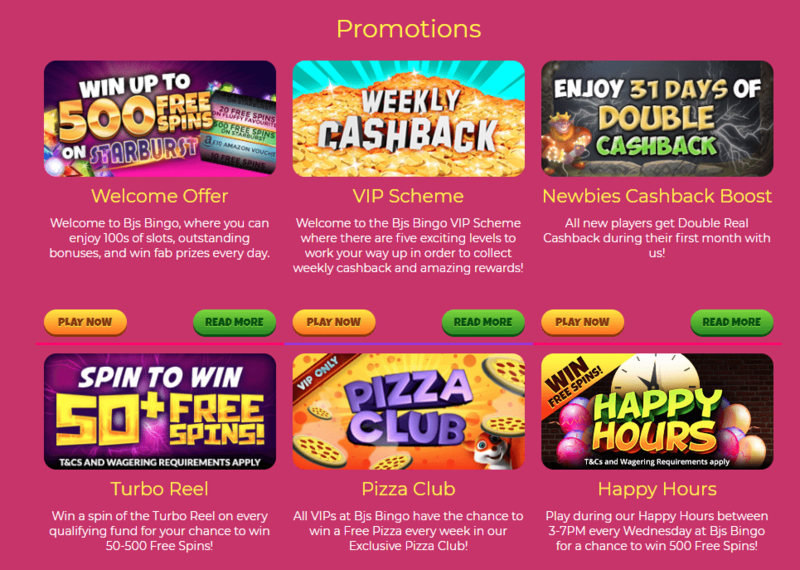 There are many bingo rooms and colourful slots for you to enjoy and possibly win big money from, so it’s even better when you can do so for free! Keep reading our BJ’s Bingo review to find out more. The prices here are fairly reasonable, but the promotions make it even better for the thrifty-minded among us. Starting out, there’s the ‘Spin the Wheel’ deal offering a chance to win free spins on every deposit. It’s the current BJ’s Bingo promo code that’s for new players only, so we recommend signing up sharpish to get in on it. When you register and make a first deposit (minimum £10), go straight to spin the mega reel and you could unlock up to 500 free spins on Starburst, Amazon vouchers or free spins on Fluffy Favourites slots. If this welcome offer wasn’t enough for you then pop to the promotions page to read up on the Newbies Cashback Boost. All new players are automatically signed up to receive at least 1% of weekly cashback over 31 days, and the more you play then the more that percentage can rise to by the end of the month. This scheme may be designed to benefit loyal newbies, but they show the same appreciation for returning customers too. If you decide to make this your go-to for entertainment in the long-term, look forward to ascending the VIP levels. There are 5 levels, with legend being the one to aim for and better rewards each time you go up. All you have to do is play more and collect Kudos (1 for each £1 deposited) to score the free spins on slots, birthday bonuses and weekly cashback a legend deserves! There are other regular promotions to take advantage of as well. Put Wednesdays in your BJ’s Bingo calendar for its Happy Hours offer. This gives you a chance at extra free spins to give your account a mid-week boost, but you can also do this on the Turbo Wheel any day of the week. The deal we love most is a Sunday special, where you can join the exclusive club for a weekly chance to win a £20 pizza! Now most sites give you a chance to score extra dough, but you’ll definitely want a pizza this unique deal. Please excuse our cheesy jokes, but doesn’t it show they know how to give us what we all want most – which to be honest is pizza (mine’s the stuffed crust with extra peppers). The gaming choice is enough to keep most happy, bringing you the classic 75, 80 and 90-ball bingo. You’ll find each of these in the designated bingo room, where you’ll discover an exciting selection of games to maintain your interest. VIP members get access to a further four rooms, so it never gets old. This is one top feature for our BJ’s Bingo review. Take a look at the featured options and online scratch cards if you have time to spare – you won’t want the fun to stop. Plus, as a larger brand they have the capacity to offer progressive jackpots that pool together money so you can take a chance at truly life-changing, big money prizes. The numerous slots are undoubtedly a main draw of this site too. Their speciality is fantasy, so if you like escaping into new worlds then there’s plenty to keep you occupied here. If that’s not your bag, there’s a small number of casino games and multiple thrilling jackpots to appeal. Something to motivate you is the ticker feed on the homepage, which displays all the recent winners and their winnings. It makes things more exciting when you see evidence that winning those huge amounts has become a reality for so many, plus imagining your name could be showing up next! The colourful layout is certainly inviting, with bold pinks, purples and a dash of sparkle giving each page a fun boost. It’s also easy to navigate and find the slots you like with your BJ’s Bingo login, as they can be listed alphabetically, by popularity or by what’s new. It could seem like they’re all about style over substance with the attention to detail on each page (and kitsch girly girl look that has perhaps been done before). So you’ll be glad to know that they’re powered by Jumpman Gaming software, who are well-known in the industry for all the right reasons. Providing plenty of popular games, this operating system promises you a high-quality experience. Regardless of how good a company’s software is, there are times when you’ll want help or advice. Which is why the great customer support here is a valuable factor, with a live chat feature to let you discuss issues in real time. The helpful staff are trained to recognise problem gambling and offer support, plus there’s also a way to contact them on WhatsApp. It’s a shame this is only available on weekdays though, but at least there is an email, FAQ section or Facebook to turn to. Other websites which are run with the same software include Volcano Bingo and Fever Bingo which both offer some top games and features. Licensed by the UK Gambling Commission and the Alderney Gambling Control Commission, they are regulated and approved to high safety standards. It’s important to only sign up and pass personal details on to fully licensed sites, otherwise you are putting your financial information and more at risk. That they own a string of land-based casinos reinforces the trustworthiness of this site, as the brands positive reputation remains intact and the head office is clearly genuine and contactable. Payment is a very simple process once you have set up an account and logged in. They work with numerous companies to provide numerous ways to make transactions, depending on what’s more convenient to the individual. MasterCard and Visa is accepted, but seasoned internet users will probably want to go with one of the E-wallet options. These include PayPal or PaySafe Card for bingo, but you can also pay by mobile which is even less hassle – just add it onto your monthly bill instead having to transfer funds each time. Not many gaming sites offer this. Withdrawal times are swift enough to keep most players happy, though there are admittedly a few faster services out there. There’s a 48-hour pending period, following which you should receive the money in between 1 to 3 working days. Good news – the site is compatible with those smaller, portable devices like your tablet or smartphone. This is essential to many customers who find that modern life is just too hectic to make being tied to the desktop convenient. The BJ’s Bingo mobile app has recently been made available, so it’s not just home computer players that can join in the fun. Download this to get a better experience, whether playing on your daily commute or while out with friends. They are still updating the mobile bingo game site, so while it is one area that could do with some improvement, we’re sure to see positive developments very soon! It’s a hit with us! There’s room for improvement as you can see in our BJ’s Bingo review but it should please any fans of colour, cashback rewards and of course, fans of bingo. Their brand definitely has set itself up well to translate their success offline to equal success with the growing community online. They utilise the resources of Jumpman Entertainment Ltd to keep up with all the latest technology and introduce their established brand to a modern audience with high standards. They also offer some great BJ’s Bingo promo code offers and ongoing deals to keep you entertained. If you’re not into the female-orientated look and playful attitude, you’d perhaps be better off with one of our more serious recommended sites. However, the brand is super serious about keeping things secure, simple and so much fun – we doubt you’d regret signing up to profit from that mega wheel welcome offer. No more collecting BJ’s Bingo coupons to save money on entertainment, keep it simple from now on and use our promo codes and tips to enjoy those thrifty thrills online!